Provides moderate support and compression utilizing Aircell technology. Ideal for preventing and recovering from Grade I or II ankle sprains. Is the Airsport right for me? Aids in recovery from a Grade I or II ankle sprain. Ideal for moderate support to prevent ankle spains and other injuries during day-to-day movement. Try our Brace Advisor for personalized product recommendations to meet your needs! Shop our complete selection of ankle supports or browse additional Aircast products. Thank you for contacting Better Braces. The Airsport can be worn with your regular size sneakers, you will find you will need to loosen the laces on the brace to help accomidate the brace being a little wider for the initial fit. I rolled my ankle jogging in my gym class with the result being an avulsion fracture to the tibia. I want some support after I get out of the boot I received from the ER. What Aircast product do you recommend? 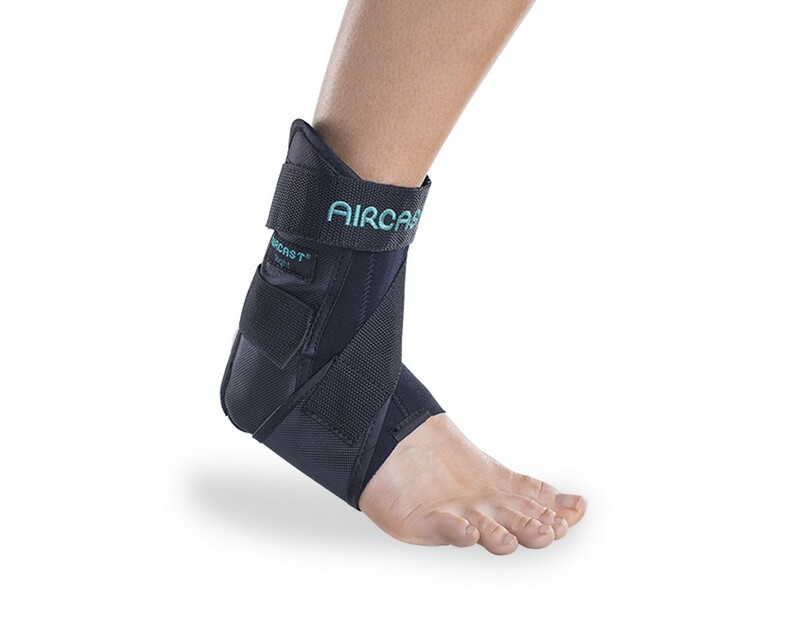 The Aircast Airsport Ankle brace will give you a moderate support on your ankle. For maximum support, I would recommend either the DonJoy Velocity Ankle brace or the DonJoy Performance POD Ankle. Both provide excellent support and protection. I wear a size 10.5 EEE walking shoes. I need the width in the toe box because of some arthritis issues. My Dr. fit me with a large Aircast left ankle brace. It seems to be doing the job, but I need to pull the cross over strap very tight to keep the brace straight. Your size chart says I should order a medium size. Any suggestions? According to the size chart, you should be wearing a size medium. Since you do have wider feet, I suggest that you go up one size and order a size large. Can this brace be worn with high top basketball shoes & does it provide adequate ankle protection? My son wears size 16 shoes. I have a size 5 shoe. I can fit into a 4 and I can fit into a 6 what size airsport ankle brace should I get? I was a competitive gymnast and have had a lateral ankle sprain for 2 years and have not taken proper care for it should I use this brace or something smaller or something bigger? We would recommend ordering the extra small Aircast Airsport Ankle Brace if you generally wear between a size 4 and size 5 shoe. This brace would not offer enough support based on your injury. We would advise you look into the Aircast FP or XP walker boot, this will provide the support and protection and still allow you to remain mobile. Based on that shoe size, the size cart states you should be in a small for the Aircast Airsport Brace. You might want to return to the Dr and get a smaller size. While wearing an ankle brace, there is a possibility you will need to a bigger size shoe. Is this brace a pull on brace? Can it be worn comfortably in a sneaker? I need lateral/side stability to prevent eversion or strains. Yes the Aircast Airsport ankle brace pulls on and it can fit into a shoe. I was told im suppose to wear a aircast, is this the same? And how many hours a day should i wear it? I was wondering if this brace contains any metal. I will be going to a venue with strict rules about metal object and I'm not sure if this will pass through. Thanks. Suffering from Achilles tendinitis, I purchased the AIRCAST AIRHEEL ARCH & HEEL SUPPORT... Can I wear the support WHILE playing tennis? The Don Joy Stabilizing Pro Ankle Brace would be a good choice for her to wear . How do you clean the aircast? The doctor is requesting a Aircast Ankle Splint ... for a ankle sprain ... which product would best fit that description? Are any of your braces safe for the swimming pool (chlorine)? My daughter has a tendency to roll her ankle. She spent the last month of soccer season being taped up by the trainer. However, we are now into swim season and there is not a trainer at the pool to tape her up. She is having ankle pain when pushing off the walls during flip turns, so I am looking for a brace that will last in the pool (which it seems most say they won't) but can't find that information for the Stabilizing Pro or Airsport. Any of our ankle braces can be worn in the pool, you just need to rinse the brace out with clean water afterwards and let it air dry. I had a grade 3 ankle sprain years ago, non-surgically managed, but have remained a runner for years (...with recurrent injuries). I would like a brace with good lateral support for running. My issue with most braces are the seams - they cut into my foot even on short runs. It seems like the Aircast Airsport has the stability I'm looking for. How bulky are the seams? Are there any seamless options? Do you have any other suggestions? I picked up the Aircast Airsport at my local medical supply store. They gave me a large, I wear a women's size 8.5 or 9 shoe. It doesn't feel comfortable, was I given the wrong size? I am a yoga teacher & I fractured my Fibula (healing now) but also have a tear in the Fibularus Brevis Tendon & instead of surgery my DR recommended I wear a stabilizing brace to practice & teach. Would this brace be ok or is their another one you would recommend. I take size 7.5 to 8. My concern is that i have wide feet. Should i still order the size small? Thank you for contacting Donjoy. Since you do have a wider foot I recommend that you go up in size. Size at the forefoot the brace slides on like a sock. It may be a little too snug for you in this are. I wear a mens size 8 1/2 shoe but my ankle only measures 7 inches (measured 1 inch above ankle bone). What size brace would be the best fit? I have compound fractured my ankle 3 months ago and am going to be getting out of my aircast boot(the boot was awesome thx). I am wondering what would give me the best support and fit in a hiking boot. I was given this brace by my Dr when I sprained my ankle yesterday. I sprained my right foot but they mistakenly gave me a left. Can they be worn on either ankle or do I need to get one for the correct side? I have been playing competitive Ultimate Frisbee for the last few years at the college level and have a tendency to have mild to moderate ankle sprains on both ankles. Since I have not recently had an ankle injury, I am looking for a product that would help to prevent having these same ankle injuries that I have been having. Is this the best option for that? I play soccer and was wondering if this brace would work for that. I suffered a severe sprain a few days ago but was told I could play again in 2 weeks but I need to wear an ankle brace. How do I wash an Airsport Aircast?? Are there any distributors of Aircast in the Newark, Delaware area ? My 15 yr old daughter is a high level soccer player. About 2 weeks ago she had an eversion ankle sprain and a possible bone bruise. Ankle is feeling well with motion but is painful to touch. Which one of your braces would work best in a soccer cleat and for her injury? She does need full range of motion. I need an everyday brace after ankle tendon injuries, however I find many to be uncomfortable as I have ample ankles and the stays dig in. Is there somewhere I can find ankle measurements for this brace? The brace will protect your ankle on a wieght maching. This brace is one of our more supportive braces, it works very well. Is the brace bulky in the shoe area? im a size 6 what size should I get x small? I have a minor fracture of my talus and am going to be transitioning from a boot to a brace. I was wondering if the airsport brace can be worn with a pair of dress shoes or flats. I have a function that I need to attend and dress up for. i had a medial malleolus fracture an my ankle is just out of cast.i do lot of running and play games like basketball,football so i wanted to know which brace between A60 and Airsport would suffice my requirements also i wear a size 8, should i go for a small or medium size brace? since you just got out of a cast, I would suggest the Airsport ankle brace. If will give you more support than the A60. the A60 is a lower profile brace and is a little slimmer in design but offers only mild support. That might be something you could transition into after you ankle has gotten stronger. Does the Air cast Ankle brace come in white? The one that has the cross strap. It's for a level 1 or 2 ankle sprain. I am only seeing it in black. I am coming up on 12 weeks post achilles rupture surgery and will be coming out of my rigid boot. I'm not to wear a brace fulltime but feel I need something for those days on the job when I'll be on my foot most of the day. Is this recommended for achilles therapy? My son is 9 and has fractured his ankle twice in the last six months due to chronic ankle instability, once during gymnastics and the second time during soccer. His orthopedist has him in a neoprene brace with a figure-8 strap, but this brand brace is not very durable. I'm looking for a brace to control ankle eversion during sports and that can be worn barefoot, as he surfs and needs protection in the water. Would the Aircast A60 or Airsport provide better support and prevent rolling? Thanks! Hi I recently had surgery 4 weeks ago for an Osteochondral Defect in my Talus. I will be getting off crutches and boot hopefully soon and I was wondering what ankle brace you recommend. I do not want my surgery to fail and since I'm an active person I just want to prevent it. I'm between the Airsport and A60. However, I don't know which one will be better for me. I am a Zumba Instructor and very active like I said. Advice? Thank you for your question. The AirSport will offer more support than the A60. The A60 is more streamline. Both will fit into an athletic shoe. If you are looking for mild stability the A60 would be appropriate. However, if you are looking for a more moderate level of support you would want to go with the AirSport. This brace is more comfortable to wear and provides more support than any other I have tried...and I've tried many!! I also appreciate the ease of putting it on. No laces and you don't have to be a contortionist to get hold of all the straps. Bravo! This is the third one I have ordered. This was prescribed by my doctor. A doctor gave me too many steroid shots in my foot and ankle and it caused my tendon in my ankle to tear. Must always wear the brace to protect it. My orthopedic doctor is pretty low on how to care for my broken ankle. I was in a cast for six weeks, a walking boot for two and then he didn't tell me what to do after that and I still had another 4 weeks before the next visit. So I ordered the AirCast from your website and have been using it instead of the gigantic boot. I won't see him again in six months so in the mean time, I will wear your brace whenever I will be walking any distance. Thank you! It seemed a little more bulky when I first put it on than I expected, but it worked better than I hoped. It kept me from rolling my weak ankle on a hike over very uneven ground. The only issue I have with this brace is that the lower strap is not long enough to be held in place by the larger cross strap. I have been wearing this brace for years, and after just a couple of days, the lower strap starts to curl. I emailed the company about this issue quite some time ago, but never received a response. I purchased this after re-spraining my ankle in August. It works well with all of my shoes - wore it at work for a few weeks, then only when exercising. The injury was about 5 weeks ago, and I am back to running with the brace. It was just what I was hoping for - extra support while the injury heals and allowing me to run again. Good product providing great support. I use it when playing tennis to protect a chronic weak ankle.